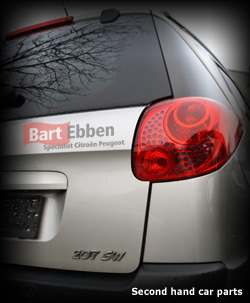 All kinds of used car parts Peugeot 207 can be shipped from stock by Bart Ebben. Our stock is not limited to just an engine, turbocharger, cylinder head or a manual gearbox, we can deliver an automatic gearbox, airbag, ECU, BSI BSM fuse box, front bumper, rear axle, airbox, throttlebody, fuel pump, starter, generator, window lifter, headlight, steering pump, steering rack, catalylic converter, exhaust manifold, flywheel, etc. just as well. 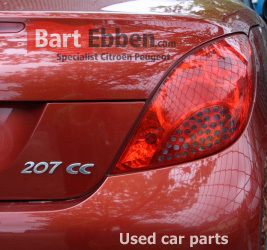 Second hand auto parts for Peugeot 207 SW and 207 cc models can be found in our stock too. Interested in all our other part groups? For all possible Peugeot 207 used car parts you can have a look at our online catalogue. The fastest way to know whether we have your spare part in stock is to send us a part request or give us a phonecall. Our salesmen will respond to your question, making sure you know all about availability, condition and price of the Peugeot 207 used car part needed. After our salesmen offered you a suitable second hand Peugeot 207 car part, shipment can be taken care of as well. We ship spare parts worldwide each day and we certainly do not take our packaging lightly. Please let our salesteam inform you on the specific, individual shipmentdetails.